As “change agents,” leaders in education must continually seek the tensions in our systems; and then, setting conditions conducive to change, we must help others to realize the crucial breakthrough moments needed to sustain transformation. Traditionally, action and strategic plans focus on long-range, wide-sweeping policies and processes to influence change. When planning for system-wide transformation, what are the potential shortcomings of our thoughtful initiatives? How can we plan for the small, significant moments of shared experience so that transformation not only takes root but comes to fruition. In Change Leader, Michael Fullan refers to the “transformative power of ‘realization’” where critical mass is actualized and key players and leaders experience the result of the needed change. Without this moment, we are sometimes left in the divergent, unpredictable landscape. In a learning system, in order to transform, we must find our way to the “learning zone” where members of the system seek to analyze, interpret, and synthesize patterns together. It’s the sweet spot where well-timed and placed constraints lead to innovation and transformation. In the natural life-cycle of curriculum, we neglect to identify the specific outcomes and results that will reveal when our goals are actualized. We plan for teams of teachers to come together and write documents. We plan for the careful revision and editing of those documents. We sometimes plan for the vetting of the ideas within those documents. And, we try to remember to plan for the professional learning needed to implement the curriculum with results. Is it even possible for a system plan for moments of actualization so that once implementation occurs, motivation can carry the system through into self-organizing patterns of transformation? What would these pivotal moments look like? Who would need to be involved? What are the necessary conditions? As a new curriculum coordinator I was charged with making sense of the curriculum that had been passed down to me through multiple past coordinators, leaders, and processes. As a former teacher who delivered the existing curriculum, I knew that it would be an impossible feat to fine-tune a few things here and there as there was no organizational pattern or process to the existing curriculum; it was written chaos. There was one solution for my district-level team consisting of literacy trainers, the elementary English language arts coordinator and the social studies coordinator: begin anew. But in our early talks about what it meant to “write” curriculum, its necessary components, headings, and features, it became apparent that there was no shared agreement as to what curriculum meant to our organization. What was our belief about the integration of curriculum, instruction, assessment, and professional learning? We turned to a body of work by Grant Wiggins and Jay McTighe, Understanding by Design (UbD), to begin the design of a mission-aligned curriculum that backwards-mapped student performances to the district’s Portrait of a Graduate. Early on in the process our K-3 English Language Arts and Social Studies and 4-12 Engish Language Arts teacher design teams struggled with authentic performance task design and progressive, conceptual rubrics that aligned to the attitudes, attributes, and skills outlined in the Portrait of the Graduate. But with the help of peer critique protocols, Word processor, and the necessary time and space, one by one, the new units took shape with written performance tasks at their core. Over the summer our greatest concern was adoption by the other 1,000 teachers who had not been a part of the new curriculum design. 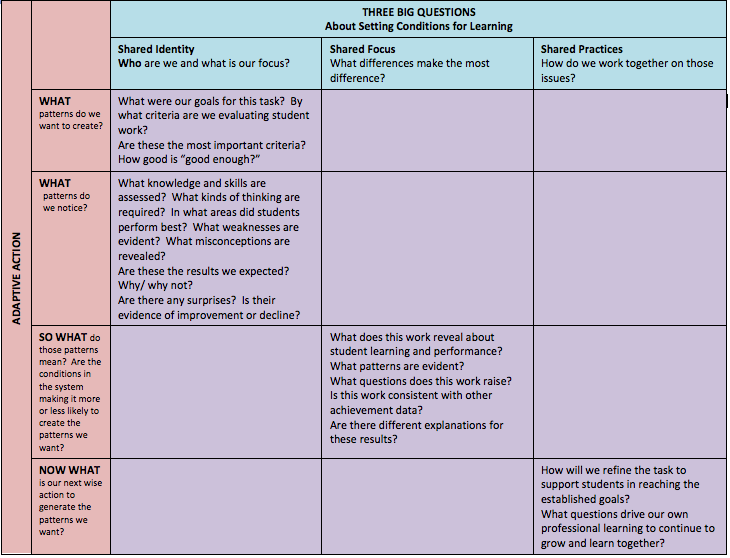 Initial professional learning in August for implementation merely touched on the “WHY” with more time spent in the “HOW” to actually read the new template. Teachers experienced a protocol for backwards planning a unit and then they were set off with a “Bang!” from the starting block. Now we are in year 2 of the new design process utilizing the tenets and principles of UbD and beginning the re-design process in other content areas. I knew that having a common understanding of curriculum was important to a learning system; what I didn’t anticipate was that in the pursuit of that common understanding we might stumble upon the necessary, unplanned-for moments key to self-organized transformation. We knew the potential of the new curriculum meant teaching for greater depth, focusing on the big concepts in our discipline rather than the isolated content and skills, and turning our gaze to original student work as the true measure of success. After the first six weeks of the year, the feedback, questions, and concerns revealed a general “fuzziness” as to the purpose of the performance tasks and their role in planning a unit. Without seeing the results of the unit goals actualized, how could teachers be expected to “buy-in” to something so radical and “new” (synonymous for “temporary”) thing? In our planning stage for curriculum design, we knew the importance of frequent days for the teams to re-convene to discuss what their own experiences planning learning with the new units and the results they are seeing from their students. Wiggins and McTighe emphasize the importance of anchoring units in student work to validate that the unit design is coherent allowing students to demonstrate the criteria and quality (in this case in their writing) that is desired. With the long-standing presence of writing assessments in our state, we felt well-versed at calibrating student work to established rubrics, but we had no experience as a team with 1) designing authentic performance-based assessments aligned to the system’s Portrait of a Graduate and 2) designing, refining, and anchoring an assessment in student work. As teams collected samples of student work from their campuses, our district-level team set out to find a process that could support teachers in the next phase of their work as curriculum designers. Understanding by Design provides processes for analyzing student work. Through the careful examination of the variations of those processes, a resonating pattern emerged–the work we were about to embark on required us to set the conditions for our teacher curriculum designers’ learning while applying adaptive action. In addition to under-estimating (and under-planning) the power of student work analysis in inform unit refinement, we also failed to plan for how we would continue to support the teachers’ transformation as instructional leaders once they were away from our community and back on their campuses. Many of them were stepping into unfamiliar territory, that of a teacher-leader. In one teacher’s own words she didn’t “know how to be their leader and their friend.” The tension revealed that the roles the teachers participating on the curriculum teams assumed on their campuses did not necessarily align to whom they had become through the curriculum experience. When with their curriculum design team, they were part of a professional learning community with a shared identity founded in vision and shared values. Many of them had experienced close to 20 days of curriculum design as a team over six months. Back on their campuses, they took the brunt of the criticism, the questions, the complaints, all with the highest degree of professionalism without any of the concrete tools teacher-leaders practice daily: peer coaching, modeling, and action research. Looking back, I know I saw the familiar traces of adaptive action, but now I see how the transformational outcome from the shared experience analyzing student work relied upon establishing shared identity, focus, and practice. Step 1: Teachers gather student samples for an agreed upon assessment or task and place at the center of the table. Each teacher begins by picking up a student sample and reading it silently. Teachers may “flag” student work that they want to be sure to return to with the whole group later, but they are not responding to any one specific sample. Teachers read as many student work samples as possible in 20 minutes. At the end of the 20 minutes, teachers individually respond to the questions in the “WHAT?” and “SO WHAT?” boxes in the matrix. Step 2: Teams discuss the patterns they noticed, document their shared observations, insights, and questions. During this step, teams may return to specific examples to dig deeper into patterns and start to identify exemplars in the student work samples that could help communicate to teachers and students the goals of the task and how they align to the evidence. Step 3: The team discusses its next steps for refining the performance task, the rubric, and potentially the sequencing of standards in the course so that all are aligned. Teachers also creates a list of “burning questions” that they have as learners that will guide their next level of research and inquiry either in relation to instructional practices or assessment design. Step 4: Two teams meet to share the patterns, connections, and actions they noted and respond to one another with critical questions for reflection. Closure: Ask each individual teacher to respond to the question, ‘based on the work they see, what would outsiders view is most important to us?” Invite teams and the whole group to share their responses noting tensions and contradictions in their responses to one another and to the goals of the curriculum and portrait of a graduate. During this process, the room crackled and popped with a new kind of energy. For the first time during the curriculum design, it wasn’t just the teachers’ voices being heard–it was the collective and individual voices of the students through their original work. We understood, finally, because we realized a moment when all arrows pointed the same direction that this was different; this was change. The process itself of using an adaptive action cycle as it aligned to setting the necessary conditions for learning resulted in a moment of actualization for the individual teachers, the teams, and my district team. The process provides a constraint–a support–that is both predictable and unpredictable, convergent and divergent. Through an established process, teachers form a shared agreement not only in their identity as a curriculum design team but their collective identity as a discipline within a larger learning system, and then as teachers and learners within that system. Without the shared experiences and agreement through action, there would still be too much divergence for systemic and sustainable transformation. The teams will experience this process five more times this year as we analyze student work to inform refinement to the curriculum. It is our hope that the teachers will begin to take the process back to their campuses for their teams to adopt. Their new role as instructional leaders requires that they have processes and experiences they are comfortable with and confident in to take back to their own communities where transformation can continue to occur through self-organization. As a systemic process, this adaptive action approach to student work analysis is used across grade-levels, content curriculum coordinators and district-level leaders. It can be used within campus-based teams of teachers of like subject and cross-teams of teachers. Principals, as learners and leaders within the system, can participate in the shared agreement and decision making alongside teachers as together they seek patterns, find the tensions, and strengthen their shared identity, focus, and practices as a learning system. Students, themselves, can participate in the process to ensure their voices are heard, and they have a role in the decision-making. Dig deeper into the tension that resulted in the teachers’ individual responses to the question, based on the work they see, what would outsiders view as most important? It’s unclear if contradictions appeared in their responses as a result of their analysis of the student work or as an indicator that their understanding and vision of the performance tasks was different than the group as a whole. Outsiders would say, students are understanding how literature throughout history still relates to current events or human conditions. They would say that individualizing the writing and reading process is very important to us. They would also say that spending a lot of time reading and writing is a priority. Based on the work that they see, outsiders would say that editing and revising is most important; however, they would be concerned with the lack of strong basic skills such as complete sentences, capitalization, and punctuation. That story-telling and creativity is valued more than grammatically correct writing. 2. Plan for how to set the conditions in contexts outside of the curriculum teams so that more moments of realization can occur across the system. One way I’m beginning to do this is to facilitate the same process with campus-level teams. But, do the necessary conditions exist for the process to be sustainable once I leave? If a group has not established a shared identity, focus, or practices, then what? My hypothesis is that the more shared experiences we can create, then the faster change and evidence of transformation will occur. As a predictable routine, applying adaptive action to student work analysis strengthens desired behaviors and patterns we value. As a shared experience, the analysis strengthens the shared identity of the system–top to bottom–reinforcing agreement, which in turn allows for greater self-organization and faster transformation. It’s small, but it’s significant. And most of all, it’s powerful stuff. This entry was posted in adaptive action, leadership, Uncategorized.